A collection of documentaries, videos and film about the Everest Base Camp Trek. A great way to find out what to expect from the trek via other peoples experience. There's also some really nice high altitude footage in HD which is quite simply breathtaking. Finally for those that have enjoyed Nepal and trekking it's a great way to relive some of those great moments and shout out "I remember that bit!!" More videos added every week - got a video to share? Let me know! A one hour documentary of the trek to Everest Base Camp. From a brief tour of the city of Kathmandu to flying into Lukla and hiking the almost 100 miles round trip to base camp. The first 30 min's is a great introduction to what you might expect on a trek. Everyone's experience will be different (time of year etc) but this is still a good into. A short timelapse video showing the stunning Milky Way over Mount Everest. Well worth watching on HD. A fun diary from two backpackers trekking to bas camp set to various music. Featuring a bumping Lukla landing. One of them got sick at the end where you'll see a what a helicopter evacuation looks like. Another reason why you should really read about what trekking insurance you should get for Nepal! If you are looking for something visually appealing this short HD video of the Himalayas will do the trick. Allegedly its the first HD video of the mountains from this altitude (some dispute this) but nonetheless it's a visual feast worth checking out. Of note is the footage shot of the Nepalese valleys the helecopter flys over enroute to the mountains. What's Everest Base Camp like when it's cloudy? In this video a girl sets of on the Everest Base Camp trek and sets it to music. While the video can be enjoyable the for people planning a trek it's actually very usful as it shows base camp on a cloudy day. For different weather you check out my own Everest Base Camp journal when it snows. A beautifully shot video with great scenes from the Kathmandu Valley before taking to the Everest Base Camp Trek and summiting Island peak. Set to Nepalese music it makes for a wonderful example on what you can expect from a trip to Nepal. Ever wondered what it would be like to trek to Everest Base Camp in the middle of winter? (Jan). Liren did it! A nice video showing clouds at the start, snow on the trail and then finally clear blue skies over Everest. There's even a scene of some monks sking! A long video/film from a man making a solo trek in the winter to Everest Base Camp. The video is a mix of film, photos and a narrative. It's a day to day account which may have spoilers but worth it if you really want a look at the trek. Mount Everest is 8,848 meters (29,029 feet) in height. Mount Everest Base Camp is Everest Base Camp is 5,364 meters (17,598 ft). Kala Patthar is 5,545 m (18,192 ft). You can climb Kala Patthar to get a better look at Everest. See my guide to the EBC trek for more tips. Depending on the time of year you go on the Everest Base Camp Trek you are likely to have a different experience to many people in the videos. eg winter = more snow, colder etc while September is warmer but has more people visiting it. While in March/April you are likely to come across more Everest Summiteers! 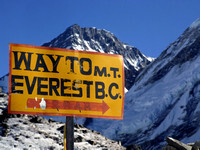 Learn more about when the best time of year is to go to Everest Base Camp. For more information check out my full free guides about trekking in Nepal. Looking for a better guidebook to Nepal? Like big photographs with lots of detail? Check out my Story Behind the Photograph series. All photographs are © copyright protected and monitored. Please contact me if you want to use them.